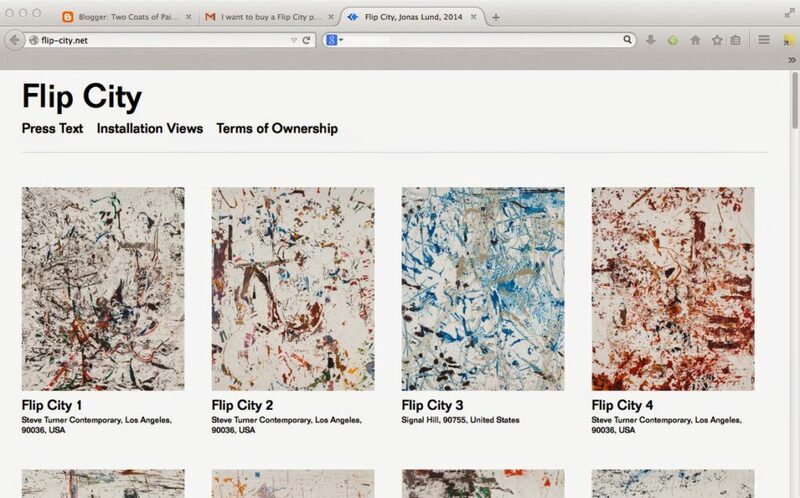 I had an idea after posting the “Flip City” update on Tuesday to buy one of Jonas Lund’s paintings and put it up for auction. Why, I wondered, shouldn’t artists get in on the action? As my dear father Dudley used to say: buy low, sell high. In my last post, I wrote that only four of the 40 paintings had been sold. When I contacted the gallery to inquire about pricing, I was told that 32 of the 40 paintings had actually been sold prior to the exhibition opening. The eight remaining paintings are designated for upcoming fairs in Bogotá (Oct) and Miami (Dec). And, Lund may decide to create a new body of work prior to the Miami fair that might also be available there. I asked why the location listings on the website had not been updated, and was told that when the paintings leave the gallery, the new locations will be added. As a painting ships, the GPS tracker sends pings to Lund, who updates the site. The gallery hopes to schedule more pick-ups this week. UPDATE (January 28, 2015): Looks like all but four of the paintings have been delivered to locations outside the gallery. They are listed in Compton (1), Signal Hill (2), Los Angeles (22), El Segundo (1), West Hollywood (1), Beverly Hills (1), New York (2), Long Island City(1), Brooklyn (2), St. Louis (1). Doesn't it seem weird that they sold the paintings before the show but have never delivered them? Maybe the gallery is trying to manipulate the artist market value, by giving the allusion of greater sales and restricting the residual, wouldn't be the first time.